Whether your company is being absorbed or is doing the absorbing, corporate acquisition can be tough to navigate. Here's what you need to know to handle your next merger. It's a big moment for your company: you're considering a major corporate merger. You chose the right time to do it--a record-breaking $2.5 trillion in mergers were announced in the first half of 2018. But there's a subtle art to a corporate acquisition. Here's everything you need to know to make sure that yours goes off without a hitch. A merger is a voluntary agreement between two businesses to fuse into one legal entity. This happens for a variety of reasons, such as gaining market shares and increasing revenue. But all of these reasons should be to the benefit of each company's respective shareholders. There are several steps to a successful acquisition. Besides hiring a corporate lawyer, of course. It can be easy to want to rush ahead. But if you don't take the time to prepare for your merger, you could be facing a failed (or sloppy) merger. That won't help either business thrive. In other words, your acquisition strategy will be your complete roadmap to the whole process. It will work hand-in-hand with your acquisition criteria, which will cover how you select the companies you wish to acquire. The criteria should include considerations like company value, revenue, margins, growth rate, employees, etc. Once you have your strategy and criteria, you can start to search for acquisition targets based on those criteria. These opportunities can come up from a variety of avenues, from searching Bloomberg to using bankers. After selecting companies for a merger, you can begin acquisition planning, which is simply the process of reaching out to management to open discussions about a merger. Once discussions have begun in earnest, you can also begin the process of business valuation. The company you're seeking to acquire will provide financial details that will allow you to perform a complete valuation analysis to get a better picture of the company as a potential asset. If the results of the valuation analysis are to your liking, you can proceed with negotiations and due diligence. This is contingent on a successful valuation and an agreement on the results of the valuation. Once this is accomplished, your company can make an offer and negotiations can commence in earnest. You need to make sure you cover the key issues and dodge any anti-trust pitfalls. In addition, after an offer has been accepted, you'll need to commence due diligence, which is the last step of ensuring that all your information is accurate. Time to show the money. Your financing strategy can occur earlier in the game (in fact, it's not a bad idea to think about it while you're creating your acquisition strategy) but this stage is when all the final pieces will start coming together. Part of this is purchase and sale contracts. Once due diligence has been completed to the satisfaction of your bosses, you can finalize the purchase and sale contracts and get them signed. Assuming that every other part of this process goes off without a hitch, it's time to finalize the deal. Any last minute negotiations and details in the agreement should be ironed out at this stage. You want to make sure all of your ducks are in a row before the final signing and hand-shaking. But this isn't the end of the acquisition process. It's the beginning of the integration process because once you've signed and officially agreed to merge, you need to do the work of properly integrating your businesses. This involves a lengthy process of reorganization of both businesses in order to function more efficiently as one cohesive entity. This is also the place where successfully-negotiated mergers can fall apart because you can run into a lot of problems if you try to throw two different business cultures together without the proper planning and foresight. In fact, 41% of merger reorganizations take longer than originally planned, and only 16% fully deliver their objectives in the planned time. As such, there are a few things you should keep in mind while reorganizing after a merger. This is actually part of your acquisition planning earlier in the game. Considering the name, you can probably guess why. It also includes the human cost that comes with merging two businesses, like consolidation of employees and the cost of the disruption caused by this process. By focusing on this process early, you can streamline your reorganization process in order to realize profits more quickly after a merger. Along similar lines, you should spend quality time assessing the current strengths and weaknesses of both sides. This can be difficult to view properly when you're in the middle of the process, and asking a business to name their weaknesses is rather like asking a parent to name their least-favorite child. Some of these questions can be answered during a thorough due diligence. How you acquire this information will also depend on whether this is a corporate takeover or a true merger. If it is a true merger, this is an excellent opportunity to see where both sides are strongest and weakest and match up. Where one side struggles, the other excels--and the one that excels should take precedence on that function. One of the biggest mistakes in the reorganization process? Focusing on what an organization looks like instead of how it actually works. In other words, you're neglecting the behaviors, capabilities, and mindsets of the people who make the business work, the numbers that are central to its operations, and other key factors that tell you important details about the business you're acquiring. You should treat this as a multi-step process that requires verification--in other words, you may develop a hypothesis about how the business works based on its valuation and due diligence, but you should see how that hypothesis holds up as time wears on and adjust accordingly. Regardless, it's important to keep several options in mind and consider many possible avenues for making things work. It's also common for higher-level executives and consultants to step back at this point, but this is when you need them the most. You need a detailed analysis based on information gathered relatively late in the game in order to properly reassess early hypothesis and develop a successful reorganization strategy. We've talked a lot about the technicalities of merging two businesses. But you can't neglect the human element--the process required to merge two disparate business cultures. A big part of this is something you were doing much earlier in the game: due diligence. The reality is, you should be analyzing corporate culture long before the reorganization process begins--even before the deal is closed. Many a merger has failed because companies neglect to consider the compatibility of company culture. This is a great time to multitask. While the lawyers are working out the legal wording of the merger, have someone else critically examine the cultural differences. You can even talk to current employees. This way you're not dropping new employees into a totally unfamiliar environment (i.e. a recipe for disaster). Once upon a time, Christmas was just a holiday created by mashing together Christian traditions with a pre-existing pagan holiday in order to make it more palatable to conquered and converted populations. This is relevant because it's more or less what you should be doing when combining two corporate cultures. While it can be tempting to rewrite everything in an acquisition company to match your own company culture, this will create a lot of problems for those employees who worked there before the merger. Instead of changing things for the sake of changing them, focus on only changing what needs to be changed for maximum efficiency and seamlessness. Above all, don't leave anything up in the air. Make sure that your hopes for the merger and expectations for what will happen are crystal clear from the outset. This will help combat the "first day at a new school" feeling that often accompanies a recent merger (especially for employees who worked at the company pre-merger). The key is to empower your employees by letting them know exactly what you expect of them in the new corporate culture, what your metrics of success are, and what you view as effective performance and behavior on the job. Now that you have an overview of each individual step, there are a few things you should keep in mind throughout the process to ensure success. Above all, you should plan for the worst (and the best). There is a variety of moving parts when it comes to corporate acquisition, from negotiation to valuation to due diligence to consolidating employees. Just because you have previous experience with mergers doesn't mean that everything will go smoothly. As such, you should consider all possible worst-case scenarios and try to plan what will happen if each situation arises. On the flipside, you should also prepare for the best. In the best of all possible worlds, what will your merger look like? Being clear on what you would like to see your merger achieve is a great way of helping it do just that. 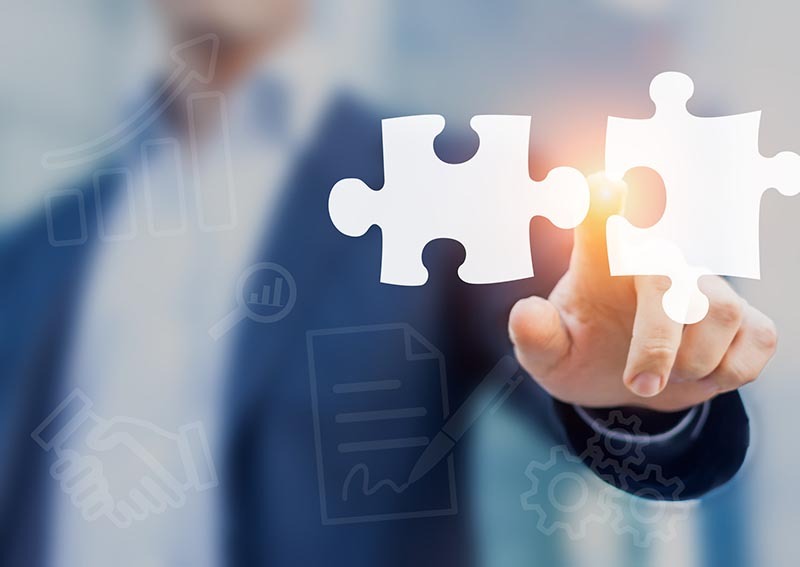 That said, one of the most common mistakes a business can make in the acquisition process is assuming that previous experience with mergers gives them an advantage. Managers are correct in the assumption that experience often adds value. However, each merger is different--even within the same industry. That's because every company is different and every company's expectations for a merger are different. As such, treating each merger as the same by assuming previous experience teaches you all you need to know is an inaccurate (and risky) assumption. Instead, mix up your merger team. Find the people that are best suited to handle a merger with this specific company instead of just the people who have merger experience with other companies. On a similar note, you should not, under any circumstances, assume that all company synergies are created equal. Synergies are the lifeblood of deals. They're also expensive, and finding them takes a fair amount of time on the part of management. They often involve greater investment than initially planned (as when you have to integrate IT systems). When you're assessing a deal's potential, don't underestimate the cost associated with synergies. By the same token, you should also carefully evaluate where the synergies are coming from so that you can plan accordingly. If your business is starting a corporate acquisition, one of the most important tools in your arsenal is a great corporate lawyer. We practice corporate and commercial law in the Edmonton area and have completed hundreds of legal transactions. So when you come to us, you know you're in good hands. If you're ready to speak with an experienced lawyer, use our contact page to keep in touch and make sure to check out our legal resources page for tips anyone can use. This entry was posted in corporate acquisition by verhaeghelaw. Bookmark the permalink.